We offer a full selection of Business telephone services, including PBXs and Trunks. To order or inquire about Business services, please contact us. Up until recently, businesses looking for phone systems have had only two unattractive options. Traditional PBXes are very expensive. Key systems don’t have the full feature set needed and don’t scale as business grows. Times have changed! Our hosted IP-PBX is almost infinitely scalable, and it's ideal for supporting workers in multiple locations or who travel frequently. The Internet seamlessly and inexpensively connects your main office with branch locations and telecommuters located anywhere around the globe. Calls between locations are free! Enjoy the benefits of Unified Communications (UC). Our hosted IP-PBX service integrates enhanced voicemail, faxes and email - saving employees time and enhancing productivity – and comes as a standard feature. With the complexities of running and growing a business, no one wants a complicated system that requires a "phone guy" or a team of engineers to run it. Our user-friendly, web-based interface allows you to configure and manage the system with very little help from us. Of course, our support team will help out when needed and answer any questions. Expensive phone system maintenance contracts become a thing of the past. Contact us today for full details on our IP-PBX service offerings! Companies are realizing they don't need to pay the monthly recurring charges associated with maintaining distinct voice and data networks. You can realize significant and immediate savings by running voice as an application on your existing data network. With our SIP Trunking solution, calls are routed via our award-winning network through the Internet rather than through the PSTN (Public Switched Telephone Network). Enterprises of all sizes realize substantial savings by eliminating the need for costly T-1 PRI circuits and the expensive telco services that go along with them. Your company can keep its existing phone equipment and phone numbers, or you can add new numbers from over 10,000 cities in the US or 60 countries around the globe. The savings and not as great as with our IP-PBX solution and it also doesn't bring the benefits of fully integrated Unified Communications (UC), but SIP Trunking gives the security and convenience of keeping your existing phone system and the features it provides. Think of it as an evolutionary step into VoIP as opposed to a revolutionary one. SIP Trunking has two flavors, or variants. The first—Address Trunking—is used if your existing phone system is already SIP-enabled and can communicate directly with our SIP Trunking application. If you are using Fonality, Allworx, Shoretel or any Asterisk-based IP-PBX, we can provide you the phone numbers, 911 service and call termination you need. 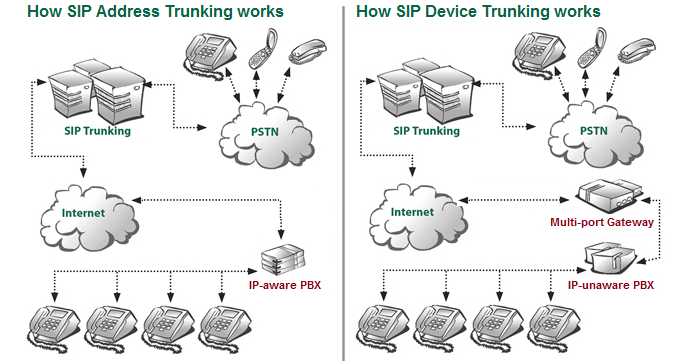 The second—Device Trunking—is used if your existing phone system is not yet SIP-aware. A multi-port FXS gateway is installed between your phone system and your LAN. This allows your existing phone system to make and receive calls over the Internet. Because our application can address each port or line of your phone system through that gateway, we can offer you features like Trunk Groups, overflow voicemail to email and Caller ID management that your existing phone system must provide under Address Trunking. Look at the diagrams below to see the difference between the two. Contact us today for full details on our fully-hosted, fully-branded service offerings!